kasih tau ke temen2mu yg lagi nyari beasiswa phd 2017, nih college di Inggris nawarin for 2017-18 academic year. info deadlinenya: Applicants who apply before 11 November 2016 and are awarded a scholarship will be notified by 31 January 2017. 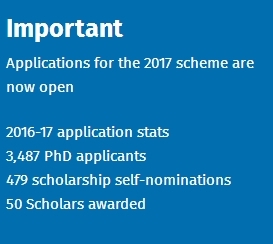 Applicants who apply before 24 January 2017 and are awarded a scholarship will be notified by 31 March 2017. Applicants who apply before 28 March 2017 and are awarded a scholarship will be notified by 31 May 2017.
beasiswanya: provide up to 50 research students with great potential the opportunity to work within their chosen research field with the support of an excellent supervisor. syarat dan ketentuan: Applications are accepted from talented candidates from Imperial College London, the UK and worldwide. There are no restrictions on nationality. will lead to a distinction. They must also hold a first class UK undergraduate degree or equivalent (integrated Masters that form part of an undergraduate degree, e.g. MEng, MSci, M.Math, are assessed by Admissions as an undergraduate qualification when determining eligibility). Candidates with multiple standalone Master’s qualifications must have achieved a distinction in the one most relevant to their PhD study. give a personal statement you must ensure that it consists of approx. 1000 words (maximum 2 pages) and outlines your academic and research achievements to date, explaining in brief your planned research project. The selection panel will not consider statements exceeding the 2 page limit. You may submit updated versions of this statement if required following application submission. 0 Response to "Beasiswa Phd ke Inggris Full Plus Dikasih Biaya Hidup dan Makan"